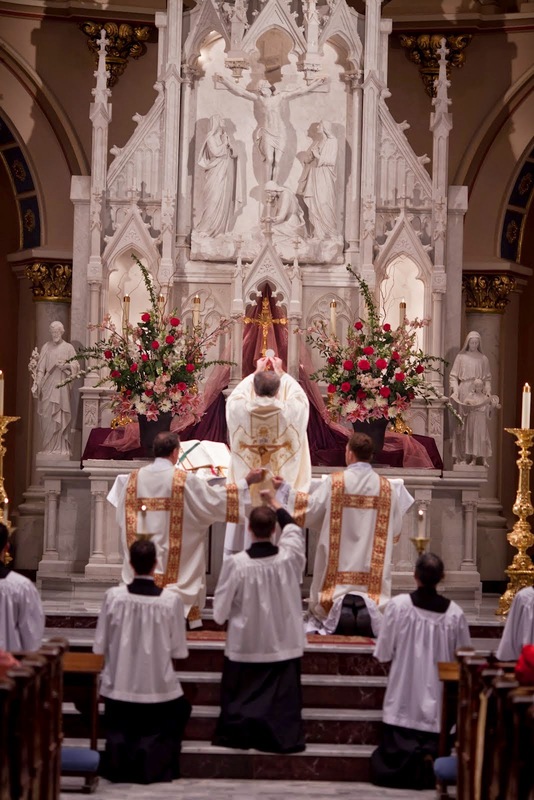 southern orders : WHAT IF AND STATING THE OBVIOUS ABOUT THE HOLY SACRIFICE OF THE MASS! WHAT IF AND STATING THE OBVIOUS ABOUT THE HOLY SACRIFICE OF THE MASS! Ordinary Form and Extraordinary Form of the Mass, can you tell the difference or which one is which? Shouldn't it be this way everywhere? In heaven, if I get there by the grace of God, I will certainly glory in the presence of the Lord. We will need nothing else, but the Lord, thanks be to God, will restore our human relationships in the communion of saints and we will hear and see the choirs of angels. What more could we want? Let me see? Apart from discovering who actually assassinated President Kennedy, I would want to see how things would have worked out in parallel time. What if Pope Benedict had been the pope rather than Blessed Pope Paul VI during the end of the Vatican II and in the period of the fabrication of the revised Order of Mass? What would the Church be like in 2015? Let's say Pope Benedict (who as Cardinal Ratzinger prior to the youth riots in Germany and Europe in 1968 was a flaming liberal or progressive) revised the Mass according to the manner in which it was fabricated by those Blessed Paul VI commissioned to do so and then His Holiness approved. But rather than shoving this new Mass down the throats of the entire Latin Rite of the Catholic Church in the most clerical, triumphalist and pre-Vatican II way possible, Pope Benedict simply stated that now there are two forms of the one Latin Rite, the venerable Traditional Latin Mass (TLM) that will continue as the 1962 Roman Missal describes with the option of vernacular Scripture readings from the revised Roman Lectionary and from an ambo and with the same careful and rigid rubrics for the Low, High and Solemn High Masses. However, the newly fabricated Mass is an option and it will henceforth be called the Extraordinary Form of the Mass. Pastors with multiple Masses on Sunday should allow for one of these new Masses on Sunday after polling parishioners if they so desire it. 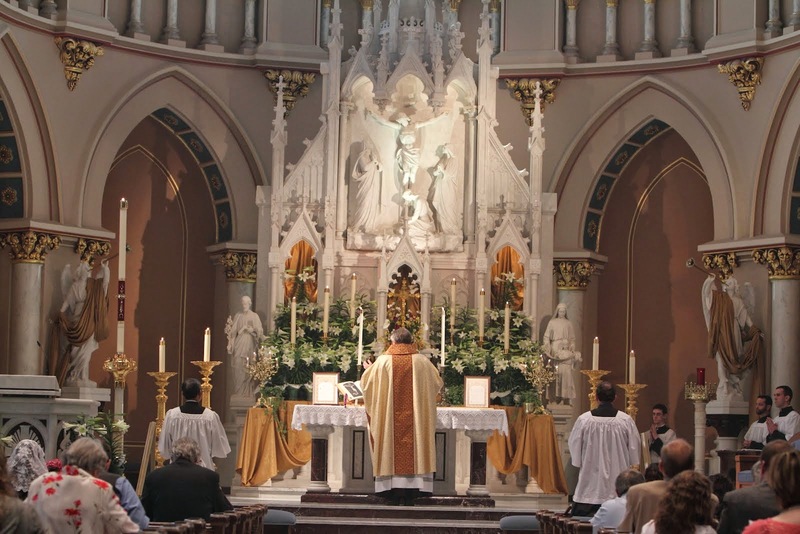 In the 1960's which Mass would have gained more popularity if the older TLM Mass had remained the Ordinary Form of the Mass and the newly fabricated one the Extraordinary Form of the Mass? Finally I hope you were as thrilled as I that in Pope Francis' unexpected pick of Cardinal Robert Sarah (it seems that Pope Benedict convinced Pope Francis not to choose Archbishop Piero Marini as the new prefect for the CDW which is really bombshell news if true, because Pope Francis was about to choose him)that we have someone quite similar in liturgical theology as Pope Benedict himself! What a relief to say the least. It seem, then, that Cardinal Sarah will help continue the trend of helping us to have the Mass that Sacrosanctum Concilium wanted for the Church, something that is a "reform in continuity" with the TLM especially in sacrality and reverence! This is bombshell good news for the Church! In the motu proprio Summorum Pontificum of Pope Benedict we must realize this is trying to reconcile the two forms of the Roman rite and it seeks especially to help us rediscover the sacredness of the holy Mass as actio Dei, (God's action) and not the action of men. We touch here on an extremely important point: the problem of the widespread indiscipline, lack of respect and fidelity to the (fabricated) rite, which can also affect the validity of the sacraments. My final comments: In the red paragraph above, it is clear that the good Cardinal is not necessarily speaking of a completely revised Ordinary Form Mass, but being faithful to celebrating it by the book, which is another way of describing "say the black and do the red!" 1. A minimal amount of Latin to include the chanting of the propers and the Kyrie, Gloria, Credo, Sanctus and Agnus Dei while all else remains in the vernacular as an option. 2. Ad orientem for the Liturgy of the Eucharist or at least the traditional altar arrangement when facing the people similar to what Blessed Pope Paul VI had for his first partially Italian Mass 50 years ago today! 1. Restoration of the Prayers at the Foot of the Altar as a preparation for the celebrant and ministers for Holy Mass and done publicly as the Introit is chanted. 2. Requiring the chanting of the Propers with no option of substituting a hymn (although hymns could be chosen in addition). 3. Restoration of the EF's offertory Prayers and rubrics for the Roman Canon. 4. Restoration of the Last Gospel. I strongly agree with the top 1-3. As for the additional items, the problem is that Sacrosanctum Concilium specifically calls for simplification of the rites, and revision of the calendar. And saying/singing a Proper Psalm in addition to a hymn, and the many gestures of the old Roman Canon, seem like examples of duplication "with but little advantage" which "are now to be discarded". I'd suggest reciting the Prayers at the Foot of the Altar with the altar boys before Mass begins, and reciting the Prologue of Saint John's Gospel after Mass. Dom Alcuin Reid has an extraordinarily informative article (click here) at NLM today, on that so-called "first Mass in Italian" on March 7, 1965. That was actually the date of implementation of the instruction Inter Oecumenici “On the Proper Implementation of the Constitution on the Sacred Liturgy”. This Instruction made the changes in the traditional Mass that appear in the 1965 Ordo Missae—simplification of the initial prayers at the foot of the altar, elimination of the final Gospel, introduction of the prayers of the faithful—allowing for some use of the vernacular but retaining Latin for the Preface and Roman Canon (then still the only EP, and more important than the Latin, retaining most of the ritual action and ceremonies of the traditional Mass. 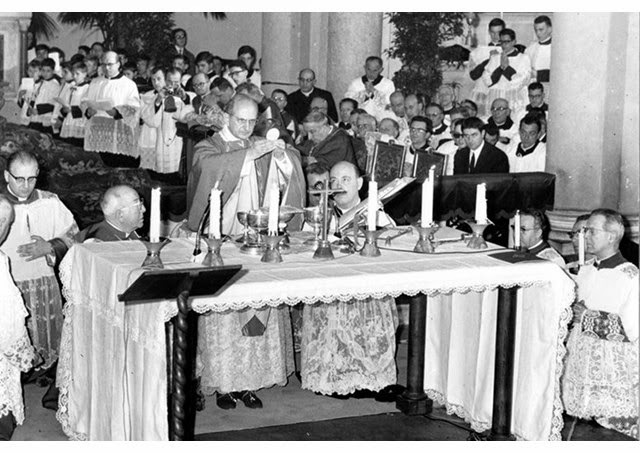 It may be inferred that at this “first Mass in Italian” Paul VI actually said the Preface and Canon in Italian, as well as the other “prayers said only by the priest” (presumably including the collect, super oblata, and postcommunion prayer). It is unclear whether the Ordinary (Kyrie, Gloria, etc) was said in Italian. 6. Mandatory birettas with poms. 8. Married and women priests. Fr. AJ., If/when the pope allows for the same things that the Anglican Use already allows. When do you think this would happen? 5, 10, 15 years? Another problem, I think [I haven't checked]: It seems Summorum Pontificum does not allow mixing parts of the EF with the OF. Ah. What if? What if JFK had never been killed? What if Mr. Obama was not elected President? What if God allowed the desecration of the Holy Mass to test the hearts of his "faithful," to test the hearts of lay people, priests, nuns, bishops, cardinals, and even Popes? To test our generation as to the truth of their claims they are believers in the Word of God, Jesus Christ? To winnow the wheat from the chaff? What if? SP does not prevent the Holy See from altering the rite of Mass. "SP does not prevent the Holy See from altering the rite of Mass." But of course, it's the Holy See. Thanks. The problem with the Ordinary Form of the Mass is the involvement of lay people in the sanctuary, eucharistic processions, sign of peace, Extraordinary Ministers distributing Communion. This breaks up the Mass and turns it into more of a "performance". It is a constant distraction. However, I cannot see how this can be overcome because that is what the majority of people who attend the Ordinary Form of the Mass desire. Prior to Vatican II there was a unified sense of the sacred in general in the Catholic Church and a very developed sense of reverence for the sacraments in general and for the Holy Eucharist in particular. The externals were unified as well. The laity couldn't enter the sanctuary or touch a chalice let alone the Eucharist. All this was stripped to make the laity feel more like priests in the supposed sense of the general priesthood of the laity because of baptism, not Holy Orders, but we all know that the lines of the ministerial priesthood and baptismal priesthood were blurred. So the laity could do almost everything the priest could do, enter the sanctuary, touch the host, distribute Holy Communion, stand like the priest to receive and on and on. The loss of the sense of reverence that was a unity prior to Vatican II will be very difficult to recover. Not all of it should be recovered but most of it should be. In addition, the emphasis on the Eucharist as meal to the great neglect of sacrifice contributes to the problem and you can see this already occurring in 1964's papal Mass. BURNING IN HELL? IS IT POSSIBLE?